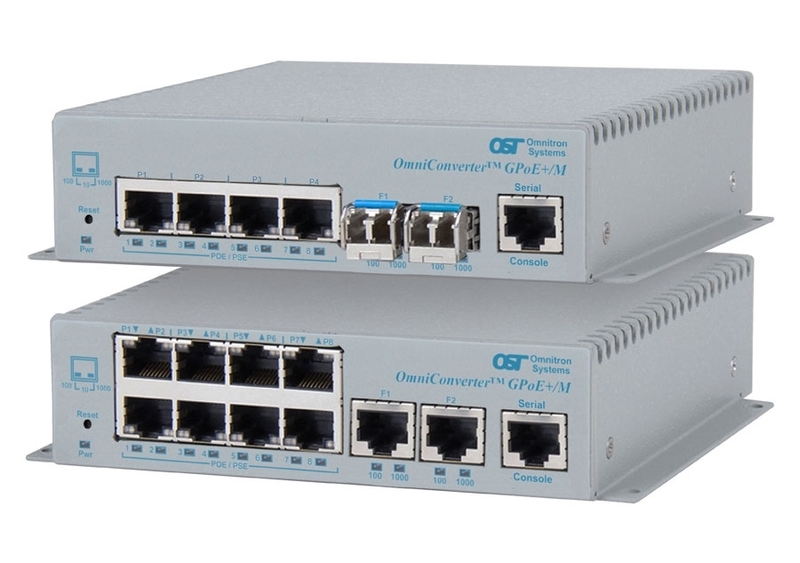 The OmniConverter GPoE+/M is a compact managed PoE and PoE+ Ethernet fiber switch that features one or two Gigabit fiber ports and four or eight 10/100/1000 RJ-45 copper Power Sourcing Power-over-Ethernet ports. The GPoE+/M enables network distance extension with fiber cabling and provides PoE+ power to all RJ-45 ports. The GPoE+/M functions can be configured using easily accessible DIP-switches or using Web, Telnet, SSH or Serial Console management interfaces. The IP-based web and Telnet management can be accessed through any of the Ethernet RJ-45 or fiber ports and facilitates the configuration and real-time operation monitoring of each port. The GPoE+/M also supports SNMPv1/v2c for real-time alarm reporting. 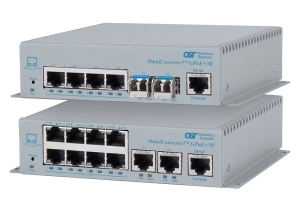 The OmniConverter GPoE+/M is a standard Layer 2 Ethernet switch that forwards frames to any port based on their MAC address. The OmniConverter GPoE+/M supports Directed Switch mode, which directs multicast traffic (such as video) only to the appropriate fiber port, preventing the multicast video traffic from flooding other network ports. Models with two fiber ports support redundant fiber uplinks for critical applications that require protection and sub 50ms restoration in the event of a fiber failure. The second fiber port may also be used to daisy-chain multiple Ethernet switches, or it may be used as another switch port. Models with two fiber ports also support Dual Device mode that enables the GPoE+/M to operate as two independent and isolated Ethernet switches. In Dual Device mode, the GPoE+/M provides separate and independent data traffic paths between the two fiber links and four or eight RJ-45 ports. The OmniConverter GPoE+/M is available with fixed ST, SC, and LC connectors or Small Form Pluggable (SFP) transceivers. Fiber ports support multimode or single-mode and dual fiber or single-fiber with distances up to 140 km. SFPs support a variety of distances in standard and CWDM wavelengths. The GPoE+/M automatically negotiates and delivers the power level required by its Powered Device (PD) partner. When negotiating to PoE (IEEE 802.3af) it delivers up to 15.4 Watts per RJ-45 port. When negotiating to PoE+ (IEEE 802.3at) it delivers up to 30 Watts per RJ-45 port. The GPoE+/M features a remote PoE power reset function that can be configured with a DIP-switch or via management. The PoE power reset feature allows all PDs or individual PDs to be power-cycled and reset remotely to save time and expense by eliminating the need to dispatch manpower to remote network sites. The GPoE+/M also features a heartbeat signal that when configured will periodically ping the attached PD. On a loss of connectivity to the PD, the GPoE+/M can automatically power cycle or shutdown the PD. The OmniConverter compact PoE fiber switches can be wall mounted or DIN-rail mounted using an optional mounting clip. They are available with 2- Pin DC Terminal and AC to DC 100 - 240VAC power adapters. OmniConverter PoE fiber switches can be deployed in a simple point-to-point topology, along a fiber daisy chain, or with redundant fiber links. In this application example, OmniConverter GPoE+/M PoE fiber switches are deployed along a fiber daisy chain. Gigabit fiber is distributed from a fiber switch at a network hub location to OmniConverter GPoE+/M PoE fiber switches with dual fiber ports that enable a fiber daisy chain with multiple locations. Each OmniConverter GPoE+/M provides fiber data connectivity and PoE+ power for IP cameras and Wi-Fi access points at each location. For secure applications requiring two separate network domains over fiber runs to the same location and independent connectivity to the Powered Devices, the GPoE+/M can be configured in Dual Device Mode. The GPoE+/M provides separate and independent data traffic paths between the two fiber links and four or eight RJ-45 ports. In the example below, the green lines represent a Security network and the purple lines represent a separate and independent Wi-Fi network. In some networks, video cameras broadcast a single multicast video stream to the entire network, and the video stream is received by all of the destinations. This multicast video can cause port flooding on other network devices (including other cameras, printers and workstations). To avoid this, multicast traffic is routed only to ports where the destination devices are connected. 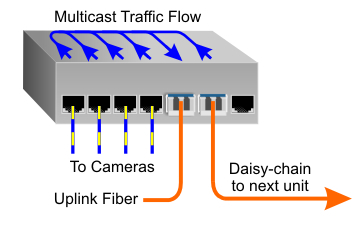 The GPoE+/M can be configured to operate in Directed Switch Mode, which directs video traffic only to the uplink fiber port, as shown in the diagram below, preventing the multicast video traffic from flooding other network ports. The IP-based web management provides easy access to all the features of the OmniConverter using any standard web browser. IP-based web management provides remote management of the OmniConverter compact PoE fiber switches, and provides the ability to remotely monitor status and configure hardware/software parameters. The management software provides intuitive and easy-tonavigate menu options for system status, port statistics and configuration screens. Configuration capabilities include PoE power, port settings, DIP-switches, VLAN, switch modes, firmware updates and system maintenance. 0 to 50°C Power availability depends on the applied DC voltage. -40 to 60°C See DC Power Requirements for the recommended input power. 162.5/125μm, 100/140μm multimode fiber up to 220m. 50/125μm multimode fiber up to 550m. Refer to the fiber cable manufacturer for multimode distance specifications. 2When using single-fiber (SF) models, the Tx wavelength on one end has to match the Rx wavelength on the other. *AC models are only available in commercial and wide temperature ranges. See specification table for power and temperature restrictions. Contact Omnitron for other fiber options. Order the appropriate SFPs separately. Visit the Omnitron Optical Transceivers web page.